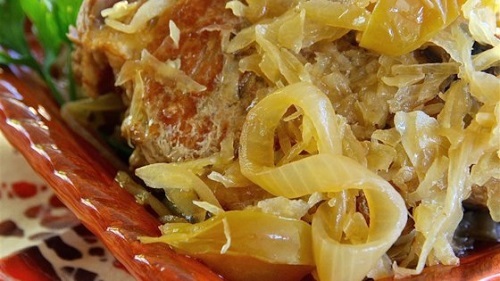 Slow Cooker Pork and Sauerkraut with Apples. The apple and onion together work magic on this classic dish. This is traditionally served on New Year’s Day. It is customarily served with mashed potatoes. The sauerkraut mixture tops the mashed potatoes like a gravy. Its surprisingly good! Recipe thanks to Katie. Heat a large pan over medium-high heat. Brown pork chops, 2 to 3 minutes per side. Drain. Cook on High for 3 hours (or on Low for up to 6 hours). Add sauerkraut and fennel seed to pork chop mixture. Cook for 1 more hour. In your oven at 180 for about 1.5 to 2 hours should achieve the same result. Have a super week ahead and happy local farms eating!